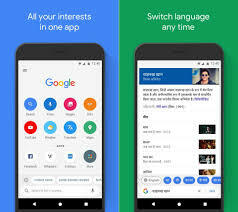 [Lagos] April 12, 2018 — Google today announced the launch of Google Go, a new app that provides a lighter, faster, way to search, with everything you need just a tap away. As more and more Africans come online every year, using mobile phones as their primary and sometimes only internet device, online isn’t somewhere they ‘go’ anymore, it’s where they live - connecting with the people, places and things that matter to them. Weak data connectivity, high data costs and low RAM or storage space often make it hard for people to get the most out of the internet - Google Go is built to handle these challenges. Taking up less than 5 MB, the app is quick to download without using much data, and it takes up minimal space on your phone. It uses the latest version of Google’s advanced compression algorithm, using up to 40% less data to display search results. Search results are also cached on the device so you can quickly re-access previous searches, even when you’re offline, without incurring further data costs. When there’s no internet access, Google Go retries failed search requests in the background and lets you know as soon as the results are ready. Web pages load quickly, even in data-saving mode or on 2G connections. What this means for the user is a lighter, faster way to search. It loads results instantly as you type and smart word suggestions help you search faster with minimal typing. The home page icons make it faster and easier for you to discover new content and find what you’re looking for with a single tap. Voice search has been improved to work better on slow connections. Add the search bar widget to your home screen for fast and easy access to what’s trending. Google Go is available today in 26 countries in Sub-Saharan Africa through the Google Play Store. It will come pre-installed on all Android Oreo (Go edition) devices, available in stores soon. It is available for devices running Android v4.3 (Jelly Bean) and above.